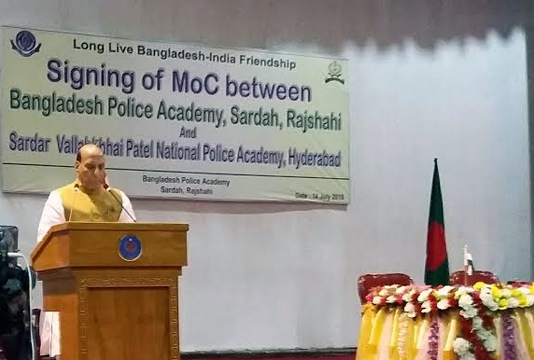 Indian Home Minister Rajnath Singh today said New Delhi and Dhaka joined hands to fight the forces of instability and terrorism as he jointly with his counterpart Asaduzzaman Khan opened a structure at Bangladesh Police Academy (BPA) in Sardah, Rajshahi. “While our partnership brings prosperity to our people, it also works to protect them from forces of redicalisation and extremism,” he told a function, marking the opening of Bangladesh-India Friendship Building at the academy. Officials said the building or “Maitreyee Bhaban” was built at a cost of around Taka 11 crore under Indian grant. They said coinciding with the event the BPA and Sarder Ballabbhai Patel National Police Academy (SBNPA) in Hyderabad of India also signed a Memorandum of Cooperation (MoC). BPA Principal Nazibur Rahman and SBNPA Director Doley Barman signed the MoC on behalf of their respective sides at BPA’s Chemney Hall with an objective to establish mutual cooperation in the sphere of training personnel in the two academies. Home Minister of Bangladesh Asaduzzaman Khan, State Minister for Foreign Affairs Shahriar Alam, Home Secretary Mostofa Kamal Uddin, High Commissioner of India to Bangladesh Harsh Vardhan Shringla, Inspector General of Bangladesh Police Dr Javed Patwary and Director General of Border Guard Bangladesh Major General Md Shafeenul Islam were present on the occasion. Rajnath Singh said the friendship building will help us to further foster our bilateral security and cooperation. The building includes state-of-the art forensic laboratory, mock crime scenes, mock police station and IT centre with computer lab to impart training to Bangladesh police force. “Our bilateral cooperation is based on mutuality of interests and a win-win formula for both countries,” he mentioned. Asaduzzaman Khan said the Indian support and initiative will further boost up the bilateral relations of the two countries.